* There are associated but independent SBHs with sweep (pairs and fours) in the afternoons at Tyne, Tees , Wansbeck and Durham - see the host clubs’ own web sites for details of the SBHs. Wins in the SBH events do not count towards the LDS series Victor Ludorum prizes. Note: BROE is opened and docs added here four weeks before each competition date. The start orders are usually issued by the Tuesday preceding and results by the Monday after. The LDS was hosted by Tyne ARC with help from Tyne United RC & Newcastle University BC. 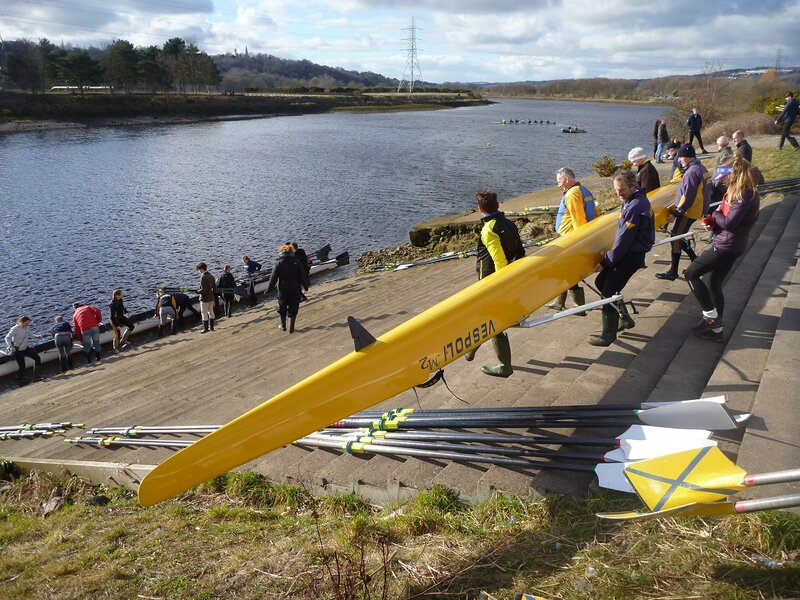 The afternoon SBH was organised by Tyne United RC - see their SBH page. Distance for both was 4500m. LDS started 10:30 and SBH 14:30. Limit of 140 in each competition. The weather was better than expected with a bit of a north wind, but not too much, no rain and even sun in the afternoon. Some excitement for the first aiders,but nothing too serious in the end. So an excellent day of racing. * final LDS results as xlsx and pdf, with bonus of a listing by boat type as pdf. The LDS was to be hosted by Tees RC, who also were to run the afternoon SBH themselves. Distance 5000m. LDS 10:30 and SBH 14:30 start. Entries for the LDS were capped at 200. But all in vain! Hosted by Berwick ARC. Distance 5000m. Single division; no associated SBH. Boating from Tweed Green, Tweedmouth, Berwick TD15 2HD. Limit of 70 entries. Distance a long 5000m. Start time 12:30pm. 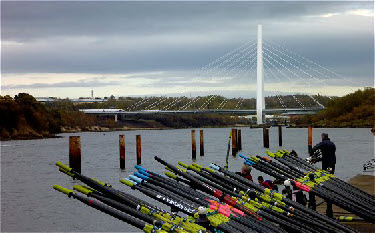 Boating starts 11.15, (see Start Order for details). 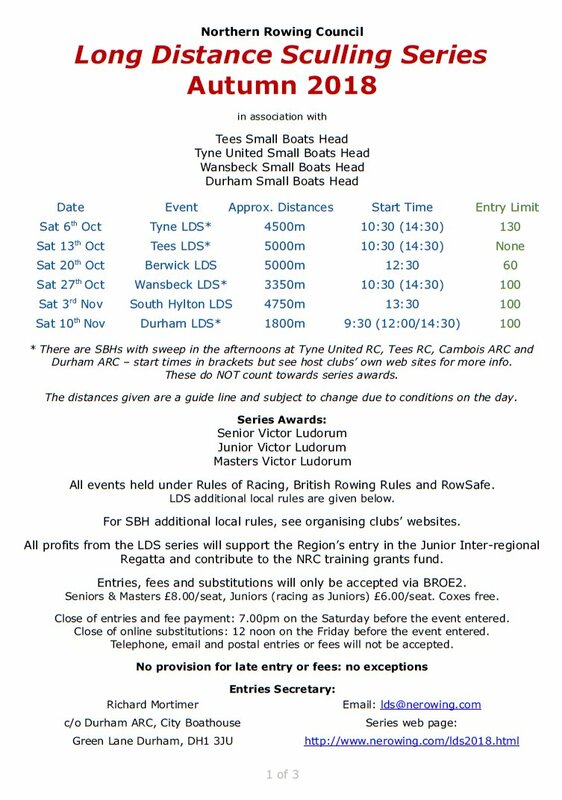 Hosted by Cambois RC. The LDS was to have been in the morning. The Small Boats Head in the afternoon was to have been run by Cambois RC and was a separate event on BROE. Distance 3500m. LDS was due to start at 10:30 and the SBH at 14:30. But it wasn’t to be, again. Hosted by City of Sunderland RC. Distance 4750m. Start 13:30. Single division; no associated SBH. Limit of 100 entries. As usual this year we had forecast of wind prior to race day and to an extent this proved correct. There was a brisk SW wind which made it hard work getting to the start and quite quick racing. However the short straight before the horseshoe bend was wind against tide and very rough (when I rowed, anyway). But manageable overall and only a small number people went for a swim, one only a metre off the steps (but he landed, changed, got back in and raced). This page last updated 10-11-18. 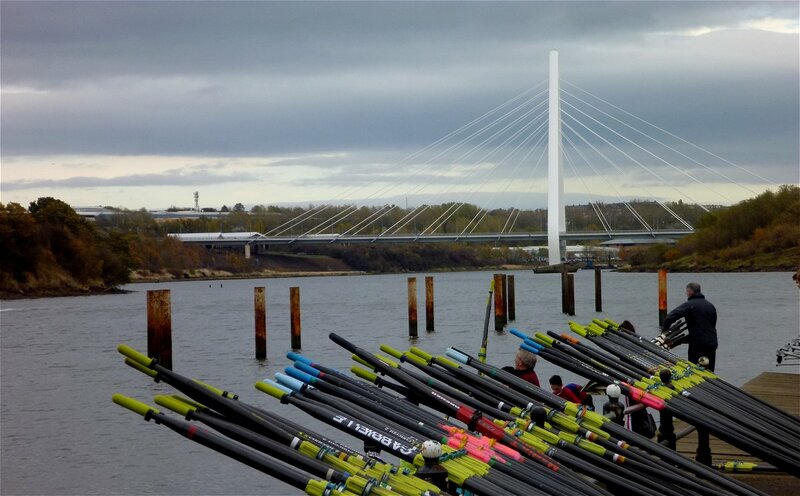 The Northern Rowing Council, with the help of host clubs, runs the Long Distance Sculling (LDS) series every autumn. In 2018 we should have had six events over six consecutive weekends, as listed below. But two were cancelled due to weather concerns. The 2019 dates can be found here. The LDS series is for sculling boats only - singles, doubles and quads (and octs where indicated on the poster). They are open to all age groups and categories. In 2018 there were associated SBH (Small Boats Head) events with sweep in the afternoon on four of the six (planned) days. 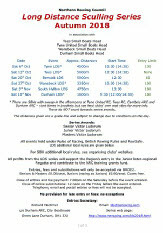 Queries about all aspects of the LDS series including entries and results should go to lds@nerowing.com. Any questions specifically to do with how this page works (or not) should be directed to Colin Percy at info@nerowing.com. The poster can be downloaded here as a pdf. Competition documents were available and BROE opened four weeks in advance of each date. See the poster for more details of how it worked.